How exactly do they plan to deploy this thing? My understanding is that it's attached to the belly pan and dropped off early in the mission (not by the arm) and the rover just drives away. Under-slung, not piggyback; that makes sense. Pardon my ignorance of rover anatomy, but, what's a belly pan, and what would it be doing without the 'copter? As its purpose is to just be a mostly unbroken sheet of metal, I guess it makes sense as a convenient place to temporarily mount the helicopter until deployment. I put this here in the 'copter thread in case anyone who reads through it has the same question. Bottom and sides are the frame of the chassis; top is the rover equipment deck (its "back"); bottom is the belly pan. 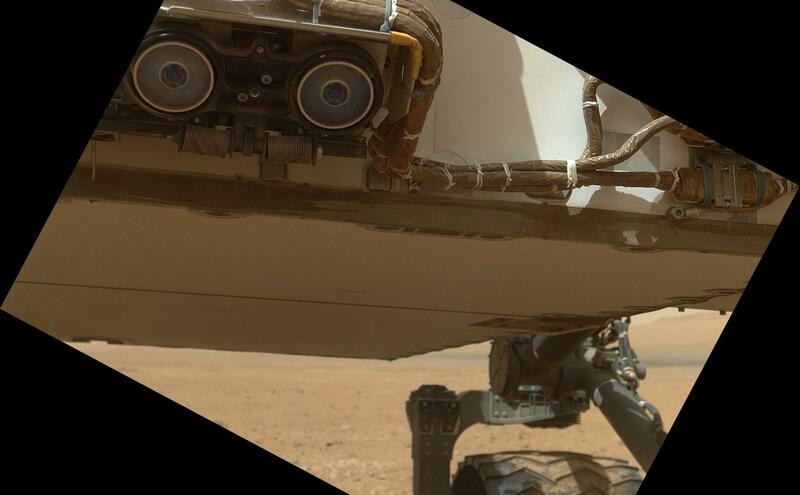 Note that for new Sampling and Caching interior workspace, the belly pan in that front end of the rover (about first 1 1/2 feet from front end) is dropped soon after the rover lands. This exposes the workspace to Martian atmosphere and makes more room for sample handling operations within that workspace. So is the 'copter mounted inside the rover and deployed by the jettisoning of fore-section of the belly-pan? Or is the 'copter mounted somewhere else on the outside of the pan and deployed in some other way? Is Curiosity's Sample Analysis at Mars suite really so large that deleting it provides so much room as to make way for the sample-catching mechanism and a tech demonstrator? For those who have it, Figure 4.3 in Emily Lakdawalla's book gives a great labeled view of interior components with the belly pan removed. 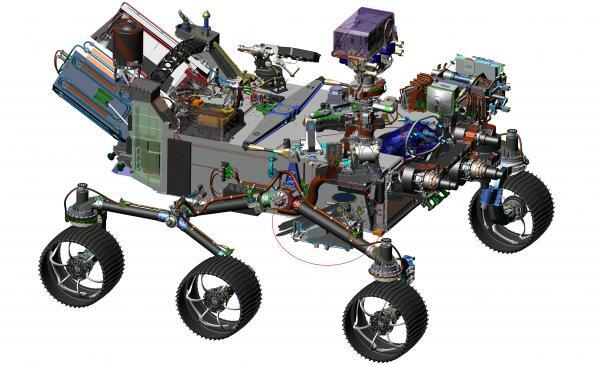 The unlabeled rover image is probably on a NASA site somewhere but I didn't find it in a quick google. I also attach edited version with the helicopter circled in red. NASA plans a 30-day flight-test campaign after release from the rover’s belly pan over a relatively benign landing zone. The first flight is planned to include a short hover, for around 30 sec. at 10 ft., while later flights gradually will see the flight duration extended to 90 sec. and altitudes up to 10 m. “We are restricting forward flight to 3 m per sec. because that suits the current navigation system capability,” Balaram says. “So we are looking at about a 300-m flight based on a projected flight time of up to 90 sec. The vehicle itself in aerodynamic terms could fly up to 10 m per sec., so in the same time it could fly up to 1 km if needed,” he adds. Here is fiso podcast on the helicopter. Good engineering overview, quite a complex little machines with lot cramped into it. The airspacemag covered most info, few extra from podcast. Motors use 250W with 500W max on tap, lot of power from very small battery. Redundant flight computers plus high performance navigation snap dragon processor for image processing. If navigation processor fails, flight computers will land drone, but no means of avoiding rocks. As per article no mention of what happens after end of demonstration flights. Assuming its still flying I'd guess they will use it to map surrounding terrain for rover. Since the Wright brothers first took to the skies of Kill Devil Hill, North Carolina, Dec. 17, 1903, first flights have been important milestones in the life of any vehicle designed for air travel. After all, it's one thing to design an aircraft and make it fly on paper - or computer. It is quite another to put all the pieces together and watch them get off the ground. Attached are the videos from the telecon presentation. And to complete the set, here's a video of the flight model test mentioned in the above press release.